Ascending Butterfly: #ad Want a chance to win a $100 @worldmarket GiftCard + do something creative? 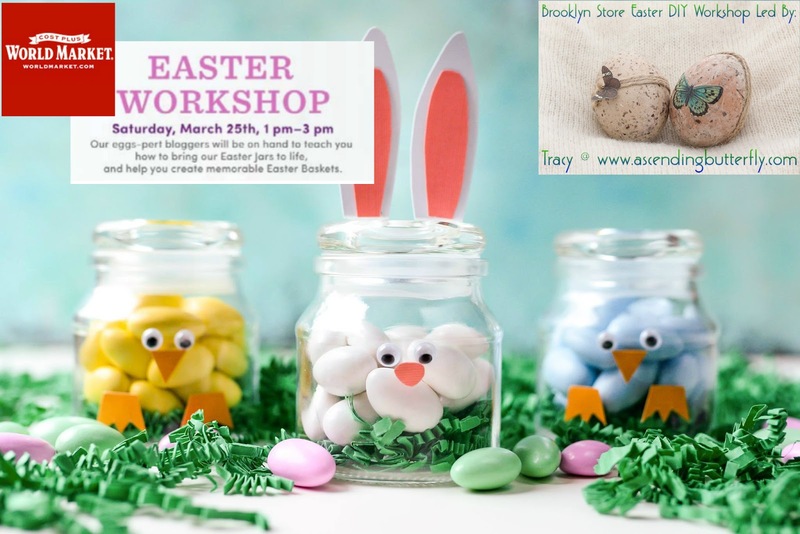 RSVP for the DIY Easter Treat Jars Workshop! #ad Want a chance to win a $100 @worldmarket GiftCard + do something creative? RSVP for the DIY Easter Treat Jars Workshop! Cost Plus World Market DIY Easter Treat Jars Easter Workshops! Press on me and make me bigger! This Cost Plus World Market Brand Ambassador is co-hosting an Easter Workshop with a fun and quick Do-It-Yourself Easter Craft (and trust me when I tell you that you don't have be 'super crafty' to master this one) at my local Cost Plus World Market and there are a few US locations hosting this workshop, and guess what? YOU are invited! RSVP HERE! Sometimes the cool stuff I do is "Press Only", but this time around you can come to! Everybunny's Invited! Join me Saturday, March 25th from 1pm – 3pm (your local time) for a fun Easter Workshop Event. "eggs-pert bloggers" will be on hand to teach you how to bring Cost Plus World Market Easter jars to life, and help you create memorable Easter Baskets. You are certainly welcome to come as you are, but be sure to RSVP first so the stores will have a headcount and know just how much supplies to have in stock so they don't run out! A little birdie told me there may be cool new in-store events like this each month this year (check to see which stores are participating) and I happen to know for a fact that next month's event (different theme, but also family friendly) at the Brooklyn Store will be starring a certain Ascending Butterfly again so I hope you will all join me! Readers Sound Off: Is there a location near you participating? Which demo did YOU RSVP for? If you got Easter Basket's as a child, which one stood out for you the most and why? FTC Disclosure: Compensated post/campaign however all thoughts and opinions are my own. I am disclosing this in accordance with the Federal Trade Commission 16 CFR Part 255 Guides Concerning the use of endorsements and testimonials in advertising see our Disclosure Page for additional information. Things that lure Ascending Butterfly out of her butterfly cocoon of fabulosity: Electronics/Technology (yes I am a Gadget Geek first! ), Fashion, Jewelry, Bubbly/Spirits, Foodie/Restaurants, Photography and Travel. Those are AWESOME! I love crafted jars like that. They really match the spirit of the season. @Ben - I can't wait to get crafty this weekend with Cost Plus World Market! I spy one in Mass! It's an hour away from me, but I will definitely try to make it. That's so adorable! I'm glad we finally got a World Market up here, I've seen so many people rave about them I'm excited to check it out! @DJ They have great stuff! Which store is closest to you? I love World Market! I haven't been there in quite a bit but I need to check this event out. @Pam Their stock is always updated and it's always a completely different world when I visit, please tag me on social if you visit and participate in the crafting activity this weekend! Awee I wish there was one in my area. Regardless you had me at EASY lol. I wish I were more crafty. I enjoy doing crafts but they can be hard! This looks fun. I think even I could do it! This is really cute. I bet my kids would have a lot of fun with jars like this. @Meagan What I love is how easy it is to repurpose them. They are put together using Glue Dots, so if you want to change them out each holiday like shamrocks for St Patty's Day or Hearts for Valentine's Day you can! Please tag me if you will be attending! Those jars look so cute heheh! I am loving those jars as well! Aren't they the best ? The craft jars are so cute! I've been meaning to try and make something like that with my girls! Looks like the Ann Arbor one is closest to me. Love, love, love World Market! @Chrystal If you attended the workshop in Ann Arbor please let us know how it went, tag @ascending1 and @worldmarket via twitter or Instagram! If you took pics during the craft session we would definitely LOVE to see them! It's always fun to learn arts and crafts. I think this is wicked cool. It would be nice to attend a session like this. @Amanda - A little birdie told me there will be another special event coming up SOON, so stay tuned here for more info! This is way too cute! We have been making tons of Easter crafts. @Chantal Would love to see some of yours too! I don't spot my area but nonetheless, it seems like lots of fun! P.S. : Those jars are absolutely adorable. Sorry there wasn't one in your area Lisa, hopefully one of the upcoming events will take place at a Cost Plus World Market near you! I have never been to a World Market (none by me, boo!) but this sounds like a super fun event for those who can go. Those crafts look so cool! @Theresa I totally relate, it took a good while before CPWM opened in NYC, in the interim I fueled my obsession online, but love having retail brick and mortar locations to visit for inspiration. What a cute idea. I love doing crafts like this with my granddaughters. I can't wait to show this to them. @Liza - Love having good craft ideas on hand for when my nieces and nephews visit, especially something that will easily appeal to both! There will be more workshops coming up Jeanine, stay tuned! How cute are these?! There's totally a workshop in my area too! Did you get to attend your local workshop? This is guaranteed to be a super fun event, however, there is not one close to where I live. I am not really crafty but I would love to try my hand at making those jars. Awe super sad that my local store isn't participating because I would totally do it! How awesome and fun!! Rachelle - There are more special events in the works, I am sure they will expand to more markets/stores as they go along, stay tuned for more details. I am all about doing crafts that you don't have to be super crafty for. I have never been that great at them although I do enjoy doing them! Those are so cute. What a neat idea. I love all these great Easter ideas I'm seeing. @Kathy I have been enjoying all the craft posts too, I think I was just as surprised as anyone else that I would end up leading a crafting workshop this Easter! This is why I love Blogging, it's never the same day twice! These are super cute ideas for Easter! World Market is a great store! @The Mommy Files - I love shopping at World Market and I always get great decorating inspiration every time I visit the store! What a great event. I wish I could attend. I would love to learn how to create those cute Easter jars. Stay tuned @Crishelle more workshops are coming up! @Eloise There will be neat workshops coming up at Cost Plus World Market, in fact I am also hosting the next one on April 8th! Those jars are simply adorable. My kids would love to go do something like this. These jars are the cutest! I am so going to look for some for our home! Those jars are the cutest! Too bad there is no store in our area that is participating. That would have been fun!